OC Sport, the international event organiser and rights holder, has opened a new base in Lorient, France. Managed by the company’s French subsidiary OC Sport Pen Duick, ‘Le HUB by OC Sport’ will draw on the company’s successful track record in the organisation of major offshore events and team management, to offer a full-service solution for international offshore sailing campaigns. Continuing their successful partnership, Caudrelier will take the helm of the OC Sport Figaro Bénéteau 3 for the next two seasons. Alongside Caudrelier initially will be two alumni of the successful Franco-Chinese Dongfeng Race Team, Fabien Delahaye and Benjamin Schwartz. Both will benefit from the resources and skills available on site, ranging from logistical know-how and technical services through to sponsorship and communications support, for their new Figaro Bénéteau 3 campaigns. Located in the heart of the ‘Sailing Valley’ in Lorient, Le HUB will take over the former Gitana Team base, offering a full range of the skills and knowledge necessary to run a successful campaign. At 1,200m2, Le HUB is large enough to accommodate two IMOCAs, several Figaro Bénéteau 3s, a Multi 50 or an ULTIME. In 2019, it will host three Figaro campaigns, whilst maintaining a focus on the construction of a winning IMOCA project for the Vendée Globe 2024. Hervé Favre, Co-CEO of OC Sport in charge of sailing, explained the company’s ambitious vision. “Lorient is a key location for us at the heart of the offshore sailing industry in France. We want to attract international teams and skippers to make use of these world-class facilities and our goal is to be active and successful in campaigns in the Figaro, IMOCA, ULTIME or Multi 50 in the coming years. Our ambition is to win races. In her wake, Nick Moloney (IMOCA Skandia - 2004), Sébastien Josse (IMOCA BT - 2008), Samantha Davies and Sidney Gavignet (IMOCA ARTEMIS - 2009), have also benefited from the expertise of OC Sport in running their campaigns. Most recently, the company celebrated its biggest ever team management success with the victory of Dongfeng Race Team in the Volvo Ocean Race, solidifying OC Sport’s credentials as industry leading campaign managers. The creation of Le HUB by OC Sport will enable the Telegramme Group to strengthen its regional ties in Lorient, and is expected to contribute significantly to the local economy. Norbert Métairie, President of Lorient Agglomeration, Mayor of Lorient welcomed the new international base. 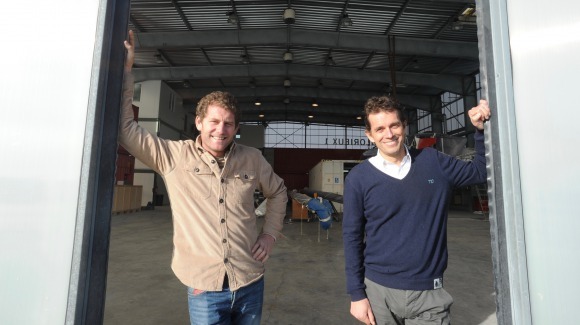 “For OC Sport to settle permanently in Lorient with ‘Le HUB by OC Sport’, is the realisation of the relations started long ago with Ellen MacArthur’s OC Sport projects in 2004 (B&Q - Castorama), then Sébastien Josse in 2008 (BT), which occupied this same hangar Glorieux 1. More recently, our relations have been strengthened with the two Dongfeng Race Team campaigns prepared in Lorient. Potential partnersm teams or skippers interested in Le HUB by OC Sport can contact Project Manager Marine Derrien, marine.derrien@ocsport.com.